With its focus on Italian ports, this compact Mediterranean cruise around Italy concentrates on its breathtaking west coast. From the Amalfi Coast and chic boutiques lining Capri, to Rome the eternal city full of art and history to sate even the most passionate historian’s interests with enticements ranging from the ancient Roman Forum and its Colosseum to a private tour into recesses of Baroque Rome, the Sistine Chapel, and the Vatican Museum before sailing up to Renaissance Florence where you’ll an overnight in port and two days to see David and the Uffizi in Florence and explore the Tuscan coutnryside from your luxury cruise ship. Finally, sail to the French Riviera before arriving in Barcelona. 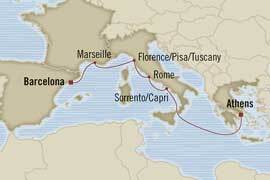 A lovely Italian ports cruise awaits you this fall. Call us today 800-227-1577 or submit form to reserve your spot aboard the November 8 2012 Athens to Barcelona affordable luxury Oceania cruise.